Washington is faced with the introduction of a new pest: the lily leaf beetle (Lilioceris lilii.) Lily leaf beetles attack lilies and fritillarias, decimating both the flowers and foliage. The pest was first brought to the attention of the Washington State Department of Agriculture (WSDA) in 2011 by a Bellevue homeowner. 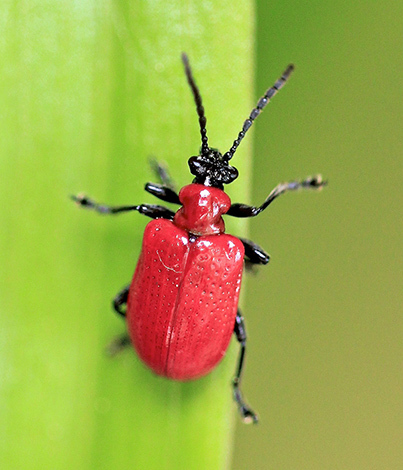 The lily leaf beetle can now be found more than 50 miles from the original infestation sites. WSDA is holding a public meeting to discuss this recently introduced exotic pest. We will provide background information on how to identify the beetle, what it feeds on, possible control methods, how WSDA is tracking its spread, and a biological control project where WSDA is introducing natural enemies of the lily leaf beetle to help control the pest. WSDA invites Master Gardeners, lily producers, home gardeners who grow lilies, and other interested parties to attend this public meeting to learn about the Lily Leaf Beetle, the project, and how they can help track and control this pest. This event is free, but please register.